(Bloomberg) -- Asian stocks bounced back in the first quarter, but the appetite for initial public offerings did not. 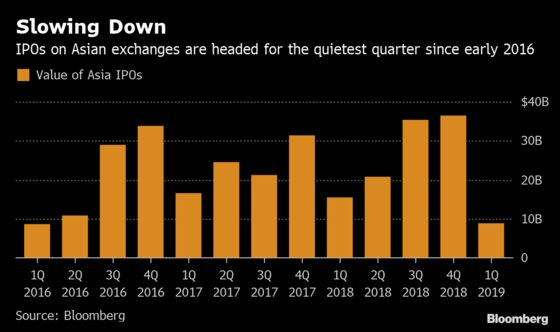 IPOs in the region are heading for the quietest quarter in three years, set for only $8.8 billion in value raised. That’s down more than 40 percent from the first quarter of 2018, according to data compiled by Bloomberg. Some companies shelved their deals altogether -- Korea Retail Home Plus REIT 1 and Hong Kong’s Sun Car Insurance Agency Co. are among those that did so this month. Never mind that the market has rebounded -- the MSCI Asia Pacific Index has climbed more than 8.5 percent this year. Concerns over a slowdown in the global economy and stock volatility have weighed on sentiment. More than 160 will have started trading on Asian exchanges in the first quarter by the end of Friday, compared with 249 in the same period last year. Still, with the market recovering -- the Shanghai Composite Index went from being the worst-performing major stock gauge in 2018 to the best in 2019 -- many expect an improvement on the deals front in Asia, especially when it comes to China and Hong Kong. “Overall, we are positive on IPOs of the A-share market and expect to see higher volume and bigger deals,” said Paul Lau, head of capital markets at KPMG China. He cited “positive impact” from the new tech board in Shanghai and listing regime for biotech firms in Hong Kong. BNP’s Wong sees more equity-linked deals from state-owned enterprises in greater China as they seek to deleverage. He expects the bigger transactions to come from U.S.-listed Chinese telecom and media companies aiming to grow or from smaller firms that went public in the past couple of years that want to improve market liquidity and valuations.